Today, I’m going to be talking wedding day truths.I know that there are some things that just aren’t talked about before the big day. Universal truths that we seem happier to ignore, acknowledge or are even aware of. To me, this isn’t a great idea because it can be these things that somehow make us feel that our wedding day wasn’t quite right, that it didn’t go according to plan or it wasn’t the ‘dream day’ that we’d set it up to be. So with this in mind here are ten things you need to know AND embrace before your wedding. If you can accept that one or two of them could well happen, the happier you’ll be come the big day. This isn’t a feature to read and set aside, it’s one to read and remember and build into your wedding day plans. In this case, I can promise you – knowledge is a wonderful thing and ignorance certainly isn’t bliss. “Accept that something will go wrong, no matter how prepared you are. Then when it does, it’s no big deal because you ‘expected’ it. THE WEATHER WILL AFFECT YOUR WEDDING DAY. Whilst I’m not exactly sure what ‘the perfect weather’ really is, I am certain that we don’t get many days where everything is ‘ideal’, especially here in the UK. Too hot, too cold, too wet, too windy or, if you’re really lucky, a combination of all of those things! Don’t ruin the run up to your wedding day by checking the weather forecast every five minutes and instead, talk to your venue, caterer and other key suppliers to make sure that you’ve got plenty of plans in place to deal with whatever the weather decides to throw at you. However, aside from all of the practical things you can do, the best reaction to any wedding day weather woes is to simply go with it. The weather won’t ruin your wedding day unless you let it. THERE WILL BE A FAMILY DRAMA. Emotions, quite rightly, run high at weddings and whilst this usually just means that you’ll spend the day being hugged, told how amazing you are and confronted with elderly relatives reminding you of all the embarrassing things that you did when you were young, sometimes it can mean that simmering tensions in the family are put in a bit of a pressure cooker. To combat this, it is, as the saying goes, good to talk. Tell someone you really trust what you’re worried about. Let them keep an eye on things during the day and ask them to step in if they think they need to. It’s not your responsibility on your wedding day to keep everyone happy – others will be only too willing to help but you’ve got to ask first. SOMEONE WON’T BE HAPPY WITH THE TABLE PLAN. Try as you might to work out the perfect table plan, it’s highly likely that someone won’t be happy with it. They might think they should be closer to the top table, not seated with certain people or they might just be a bit peeved that they’re not in a great position. However, when you’ve done your best to arrange everything for everyone, you need to step away from the arrangements come the big day. Don’t try to re-organise everything to keep one person happy and unless it’s really a matter of life or death, they shouldn’t change spots anyway. Caterers and waiting staff are briefed and prepped and any little change has a huge knock-on effect so brief your wedding day co-ordinator, parents and bridal party that changing seats is a no-no. That said, if a guest is determined to do a little place card re-organisation, don’t let their problem ruin your day. Smile sweetly and be the better person. 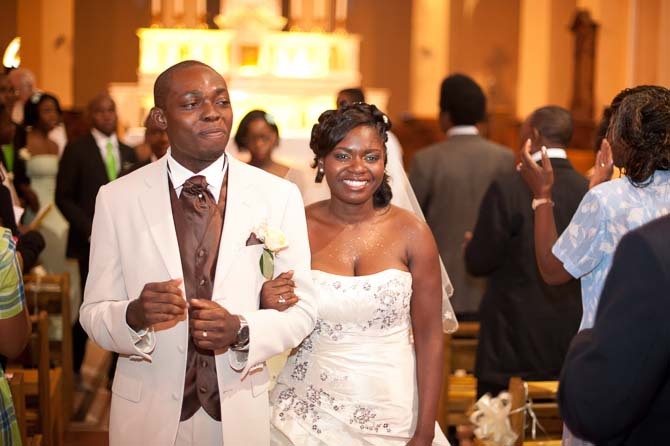 ONE OF YOUR GUESTS WILL TOTALLY IGNORE TRADITIONAL WEDDING ETIQUETTE. I can speak from personal experience here because when I got married, a friend’s girlfriend turned up in a long white dress. If there’s something you feel really strongly about (posting pics on social media during the ceremony, dress codes etc.) then you need to communicate your expectations with guests somehow – a note in the invitations or a sign on arrival at the ceremony will usually do the trick. If this does happen at your wedding it’s important to remember that people don’t often ignore etiquette to be hurtful, quite often it’s just because it’s not as important to them so they don’t realise how important it might be to someone else. YOUR WEDDING DRESS WON’T STAY PRISTINE. Walking around outside, drinks,Children, make-up – these are just some of the things that will conspire to ensure that by the end of your wedding day, your gown is a little grubby. I’ve seen brides splashed by muddy puddles, covered in drink as a guest trips over and children with mucky hands coming in for cuddles. It’s a bit messy for sure but it’s not a huge problem so please don’t worry. YOU’LL PROBABLY FORGET TO DO SOMETHING. You might have planned to throw your bouquet, give gifts during the speeches, invite your Dad onto the dancefloor after your first dance or escape for a few moments with your partner to enjoy some valuable time on your own but sometimes, in the whirl that is a wedding day, these things are just forgotten. This doesn’t mean the day’s been a disaster. You want your wedding day to be enjoyable and you certainly don’t need to spend the day checking a to-do list to make sure that you’ve done everything. If it’s really important to you, ask your wedding day co-ordinator or best friend to help ensure that everything happens but please please please, don’t fill every second of your day with ‘things to do’. Instead, let the day fill itself with happy, unscripted moments with friends and family because that’s what really counts. Here’s a truth – you forget to eat! Serious! You are so involved with wanting to see/talk to everyone that you usually miss out on your own wedding cake (I don’t know how many brides have said this in their real wedding questionnaires!) So, remember to sit down and eat! YOU WON’T BE ON TIME FOR ABSOLUTELY EVERYTHING. It certainly seems that time works differently on your wedding day. One moment, you’ve got loads of time, the next, it’s the end of the day and everything is coming to an end. It’s certainly a strange phenomenon. Now I know that part of my job as a wedding planner is to keep everything running to time but there’s definitely a balance to be struck between keeping the day moving and making sure that everyone (and I include you in that too!) enjoys themselves. So, I would say that it’s the ceremony and dinner that you need to be on time for, other things can be slightly flexible. Definitely have times in mind for that first dance for example but if a few guests have headed off to freshen up before the evening party, don’t be so stuck on timings that you start without them. Again, let someone else play timekeeper for you, don’t spend those precious moments looking at your watch. YOUR GUESTS MIGHT NOT NOTICE ALL THE DETAILS THAT YOU WANT THEM TO. All those little touches that mean the world to you and have special significance probably won’t be so important to your guests. That’s not because they don’t care, it’s just likelier that they will be experiencing and enjoying the day as a whole. Those details will be appreciated as part of the whole but put effort into the little things because you want to, not because you’re hoping for extra guest credit! THERE WILL BE SOME CRYING/LAUGHING AT THE WRONG MOMENT. Wedding day emotions do funny things to us all so don’t be surprised if you get a fit of the giggles during your ceremony or sob your way through your speeches. I’ve seen it all so I can absolutely promise you that whatever happens, you won’t be the first! All I would say is don’t worry about this – don’t worry about it beforehand and certainly don’t worry if it happens on the day. Everyone around you is there because they care about you and everyone will chuckle with you if you laugh and support you if you cry. On a practical note, if you think you’re likely to shed a tear, make sure that a bridesmaid or friend has a make-up repair kit so you can continue looking fantastic throughout the day! YOU JUST DON’T KNOW HOW YOUR WEDDING WILL MAKE YOU FEEL. As you might have gathered by now, for all the planning, weddings can be slightly unpredictable and there’s nothing more unpredictable than feelings. You might suddenly crash with tiredness, you might be buzzing all night long, you might be super happy or feel a little odd. Whatever happens, just go with it. Don’t spend too long before the big day imagining how you’ll feel at certain points – instead wait and enjoy your actual wedding day, not a version in your head. Every wedding is different, that’s what makes them so utterly fabulous. There’s no right way to feel in the same way there’s no right way to plan your day. We’re all gloriously individual so embrace it. Or embrace someone else because that always makes you feel better! I do so hope that these insights have set your mind at ease, given you a little giggle or even just reminded you that the only thing that really matters is getting married. You can’t control everything but you can decide how you react to whatever happens on the day so be prepared, smile, embrace it all and remember to be happy!